A very early navigational instrument, the cross staff was widely used among surveyors and astronomers. 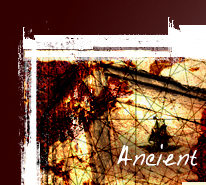 It was not until the 1500s, after it was developed further, that it started to be used at sea. The name is derived from its cross shape. It was cumbersome to use simply because a user had to focus on the horizon and star or sun at the same time; moving your eyes from one to the other and at the same time sliding the transversal (cross piece) until you achieved what you thought would be an accurate reading. It also required looking straight into the sun when taking daytime readings. It was with the invention of the back staff that these problems would be resolved. John Davis invented a back staff in 1595 and his improved design became known as the Davis Quadrant. It rendered the cross staff obsolete since the user only had to take a sight at one object and didn't have to look at the sun to take a reading. Appropriately named, its basic design is like a cross staff, but with some enhancements, and daylight readings were taken by having your back towards the sun. 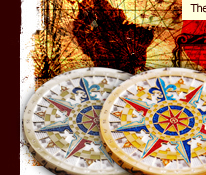 In many cases, John Davis's invention ended up replacing not only the cross staff, but also the mariner's astrolabe and quadrant. 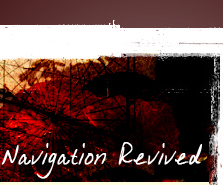 It was in the late 1700s when the octant and sextant became the new preferred tools over the back staff. 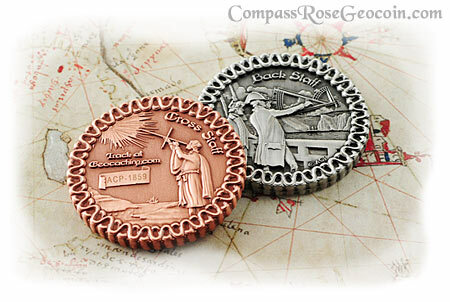 The coin measures 2" in diameter and 5mm thick. The 3-D images are made in high relief providing increased detail and depth in the design. 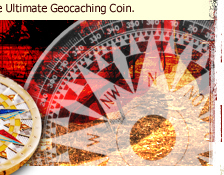 Each coin is trackable on Geocaching.com.